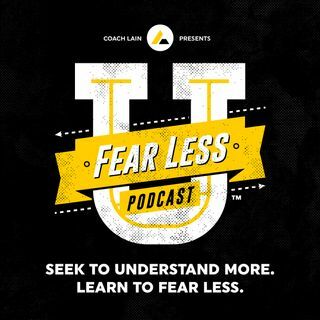 Fear Less University is a weekly podcast exploring the intricacies of fear, and how we as humans allow it to hold us back from achieving our greatness. We all experience fear. Rational or irrational, fear is very real to the person experiencing it. But fear is like a wild beast, and when you fight against a wild beast, backing it into a corner, it doesn't submit or relent. Instead, it fights against you harder, because it's just trying to survive! So instead of ... See More "conquering" our fears, what would it look like if we instead sought to understand them. Because if you can understand your fears more, you can learn to fear fear itself less. This is Fear Less University.